Have you ever gotten a call from a friend who just rank out of ink, asking to come over with a USB key to use your printer when a paper or job assignment has to be submitted the next morning, but the timing just wasn't right for you? PrinterShare can help. 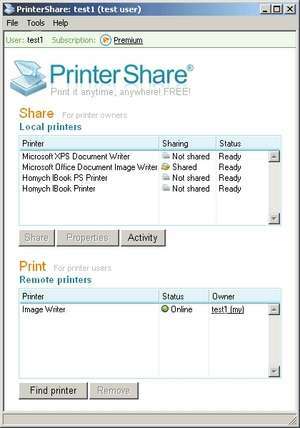 A neat little application, PrinterShare is a program which gives you the ability to share your printer over the Internet. They can print it at your place without disturbing you and you can drop it off later. Version 2.3.08 is a freeware program which does not have restrictions and it's free so it doesn't cost anything. For security reasons, you should also check out the PrinterShare download at LO4D.com which includes virus and malware tests. Additional screenshots of this application download may be available, too.